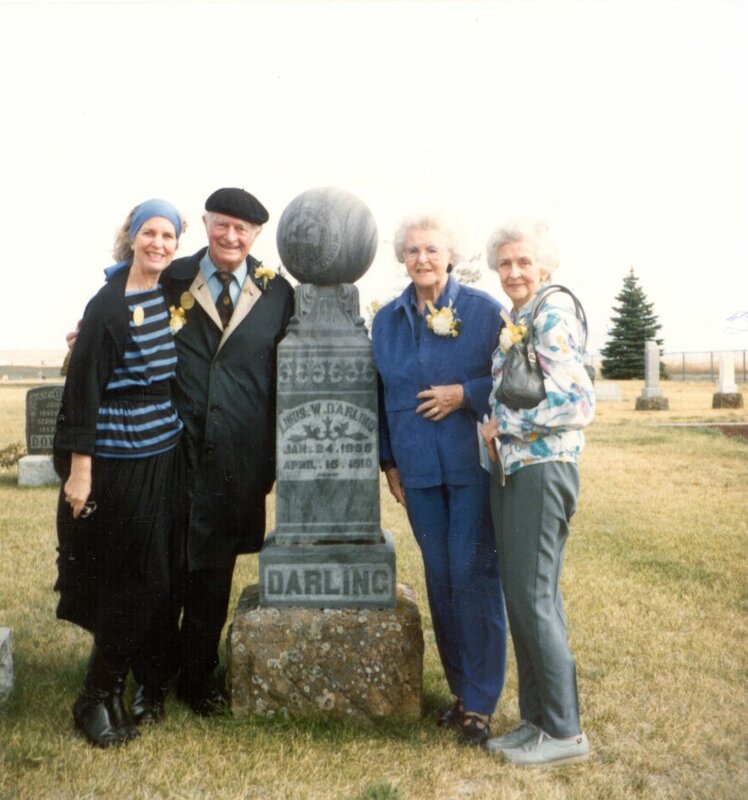 Mervyn Stephenson with his three sisters, Condon, Oregon, ca. early 1900s. If he’s lucky, every young boy has his partner when he plays ‘Cowboys and Indians,’ or when he roams the streets getting into mischief. For Linus Pauling, his cohort in crime was his older cousin, Philip Mervyn Stephenson, also referred to as Merv but who also liked to be called Steve. He was born on March 23, 1898 in Condon, Oregon to a Condon native, Goldie Victoria Darling Stephenson, who married an English immigrant, Philip Herbert Stephenson. Mervyn was about three years older than Linus, but when they were young school boys, the gap made no difference. 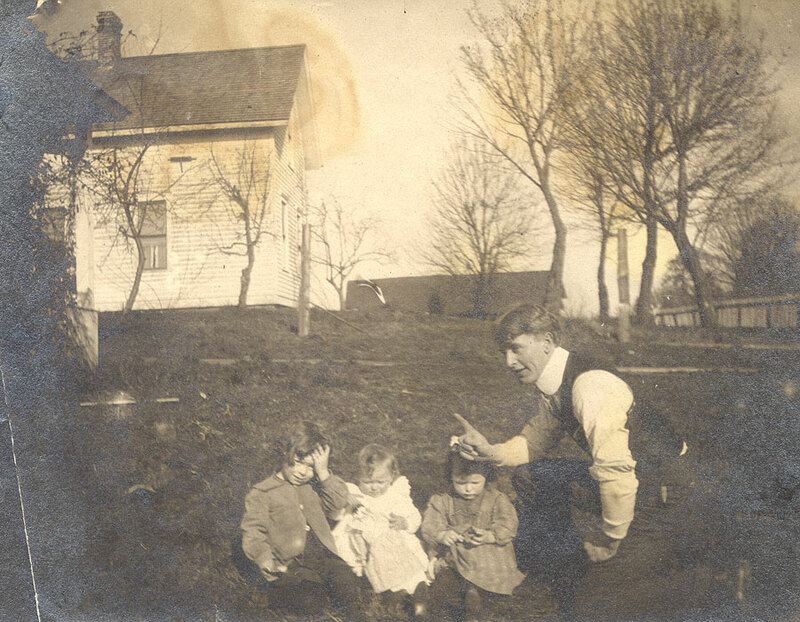 The Paulings lived in Condon, off and on, until they moved to Portland for good when Linus was eight years old, and it was in Condon that Pauling and Stephenson spent the most time together. As they wandered the town together and explored its hills and gullies, they hunted rabbits, swam in streams, collected arrowheads and, in the winter, took sleigh rides. In later years, Pauling also recalled watching with his cousin as the area’s wheat was being harvested and bringing water to the farmhands. Sometimes Mervyn’s father asked him to mind the store that he owned. Stephenson and Pauling looked forward to these occasions because these were times where they could sneak sweet treats and other good things to eat. Being left alone to watch the store also led to a few hilarious run-ins. One day the chewing tobacco was left out. The boys decided to try a small piece, probably swallowed a bit, and both got sick. Needless to say, neither of the boys’ fathers were pleased. 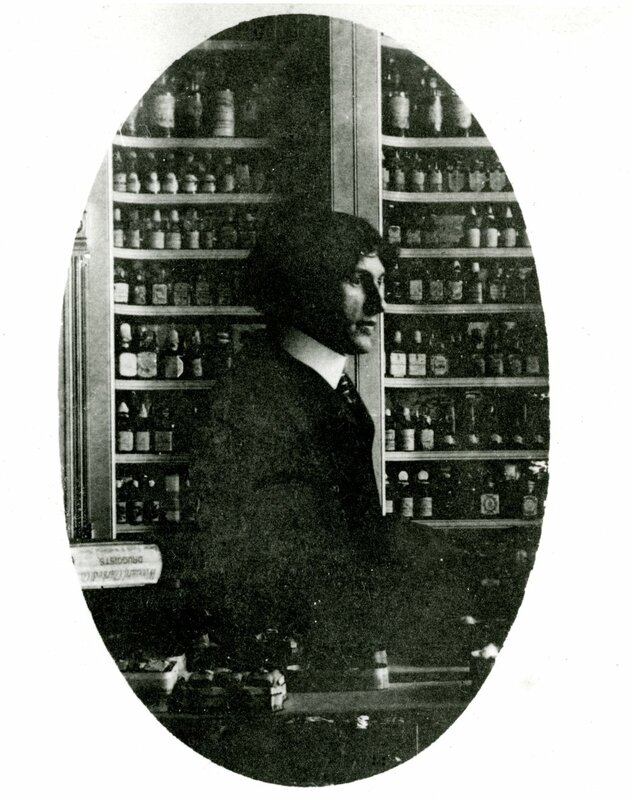 Another time, Pauling was asked by his father to watch the family pharmacy. Stephenson, of course, joined and the two decided to try the port wine—it was used for several prescriptions that Herman Pauling wrote. The boys tried a bit of wine, soon became drowsy, and fell asleep in the back of the store. The two got in trouble, once again, and that was the last of their major stunts. 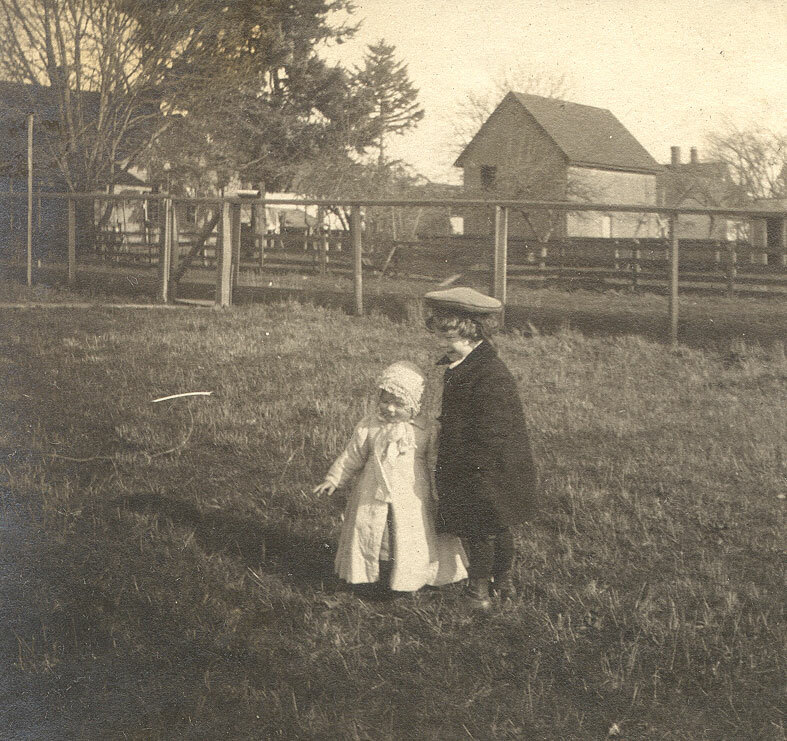 By 1909, after the Paulings moved to Portland, time spent with Mervyn never held the same childhood aura or imagination. Mervyn and Linus at Kiger Island, 1918. The Stephensons bought a family car in 1912 and, at the age of 14, young Mervyn immediately learned to drive. People in town called him a fast driver, and his father had only to call the local store or neighbor to see where his son had gone, because Stephenson would have most likely zipped by in the new car. Stephenson would also frequently hike down a nearby canyon with other kids from Condon and was a big fan of the regional county fairs. He was an adventurous young man and went on numerous excursions, including following local legends in search of a secret lake in the woods. As he grew up, Mervyn’s parents thought him to be too thin and “understrength” for his own good. 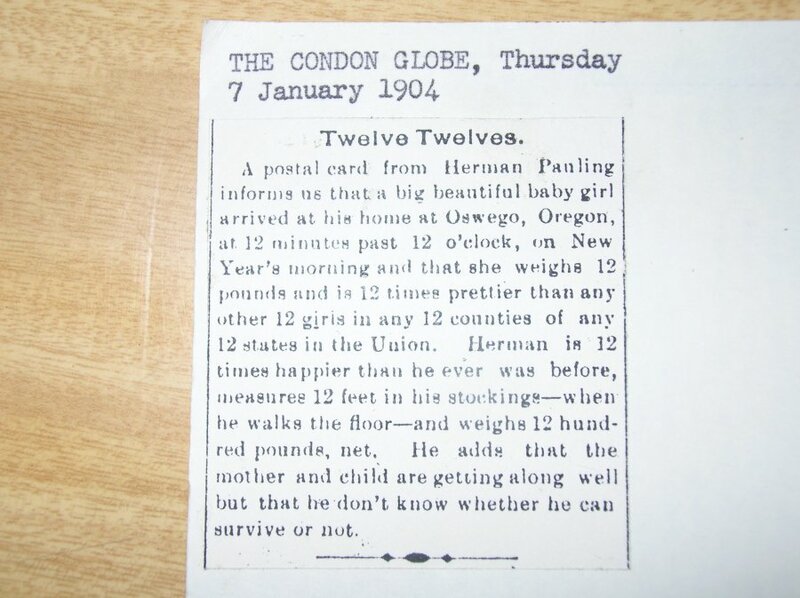 To combat this, they would send him, sometimes for a month at a time, to Charles and Nell Underwood’s house, where they would feed him well and work him hard in hopes that he might gain weight and muscle. It was here that Stephenson collected many arrowheads for his collection. Mervyn was also becoming an upstanding citizen. He was, for one, the lead organizer of the athletic boys club of Condon until he left for college. More importantly, in 1912, (the same year that the family bought their car) he was marked as a town hero for being the first on the scene of a fire in a hotel. Mervyn had heard the siren in the middle of the night, rushed over to the fire station, and then hurried to the hotel to help. The town awarded him with a prize of one dollar for acting promptly and courageously. 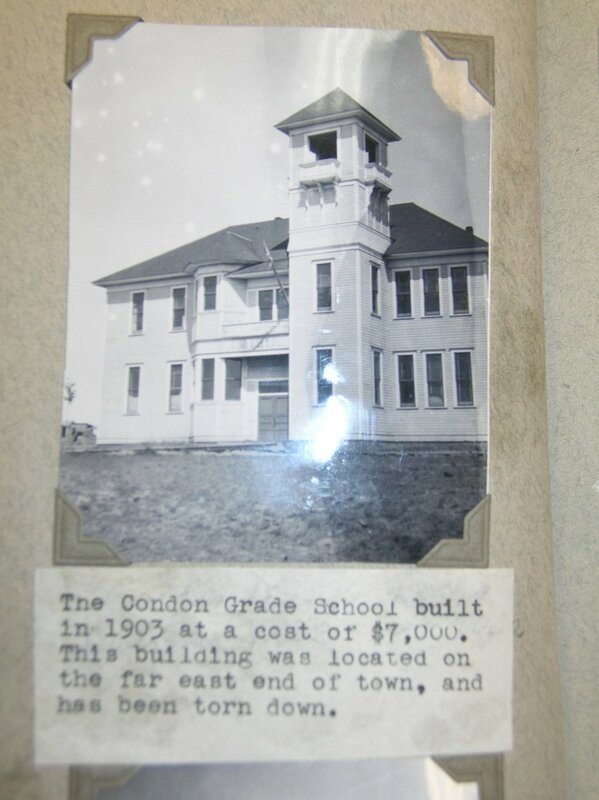 Around the time of Mervyn’s graduation from Condon High School in 1915, Professor Gordon Skelton of Oregon Agricultural College (OAC) came to town to recruit students. He met Stephenson and they talked about what he might want to study should he attend OAC. After their conversation, Skelton had convinced Stephenson to give Corvallis a try and to major to civil engineering. Mervyn visited the Paulings on his way to OAC, and he talked with young Linus, at the time fourteen years old, about his plans to study highway engineering. 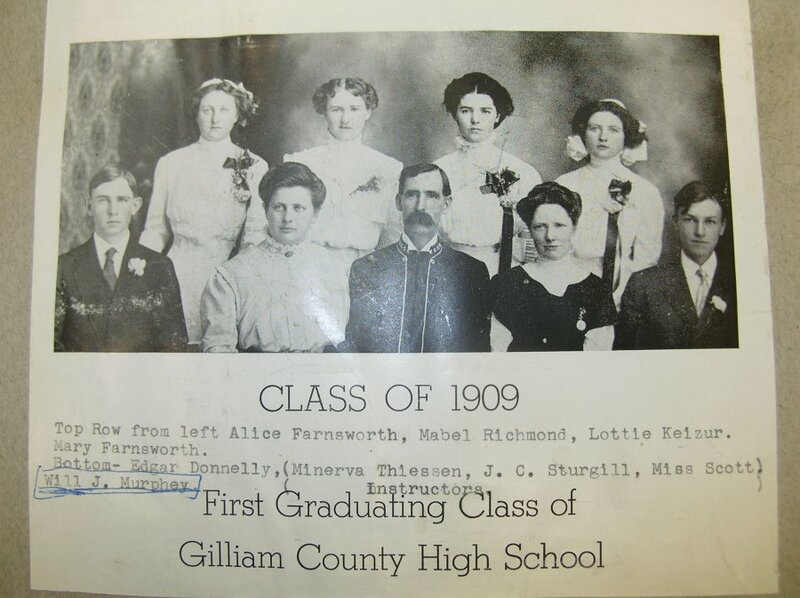 The two also discussed other programs available at OAC and from this conversation Pauling learned that the college offered chemical engineering, which he believed to be the profession that chemists pursued. 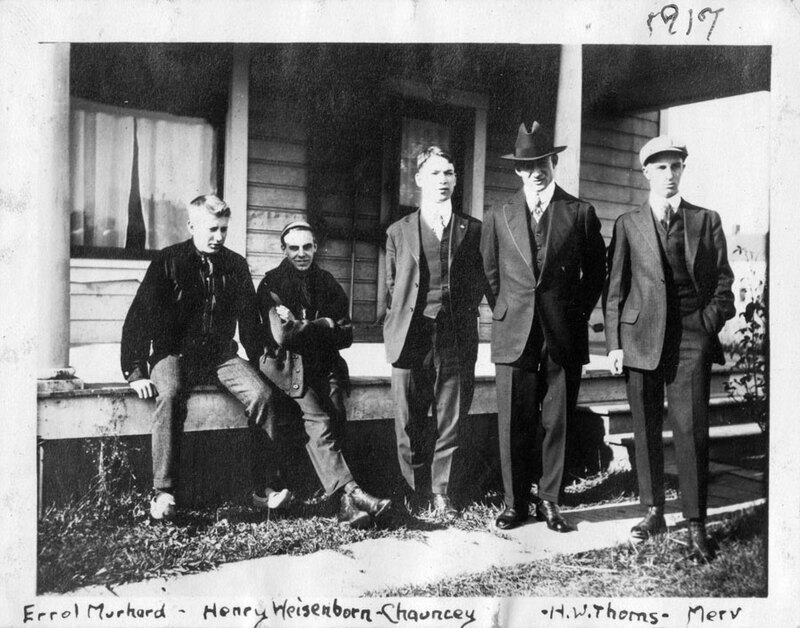 Mervyn Stephenson (far right) with OAC classmates, 1917. Mervyn worked very hard as a freshman. Room and board ran to about twenty dollars a month, and he found a campus job that paid twenty cents an hour. He made it through his first year working full time with a full class schedule. During summer break, he was hired by the county to work on road construction, and that helped to make ends meet. Stephenson concentrated on his ROTC training during in his second year at OAC; he moved up as a cadet captain and continued to progress forward. This year was also exceptionally tough because, midway through, his parents were divorced. His sister and mother then moved to Portland. That summer he worked on his first bridge, and as the break came to a close he was offered a job to continue to work on bridges. In order to take the job he would have to take a year off college. He would be paid a fair sum, but following the advice of his father, he decided to finish school and then pursue a career. The United States was in the middle of World War I through Stephenson’s third year at college. As such, Stephenson transferred from the ROTC to the SATC (Students Army Training Corps) to receive training for combat, if needed. 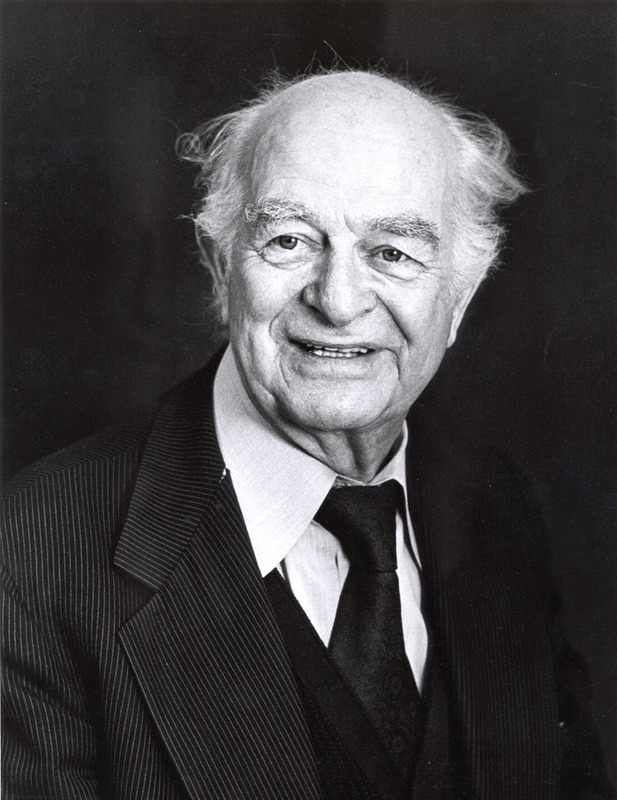 This same year, Linus Pauling, though only sixteen years old, began his studies at OAC. The only reason why Pauling’s mother, Belle, allowed him to go to college at such a young age was because she knew that Mervyn would be there for him. Little did she know that no college junior wanted to spend his time watching over a sixteen-year-old freshman. According to Pauling’s recollection, soon after Belle left to return to Portland, Stephenson gave Pauling some advice about being in college, and then left him to fend for himself in the boarding house where they were supposed to be living together. Pauling did not stay past the first year in the boarding house, due to the cost of rent, and he did not see much of his cousin while in college. 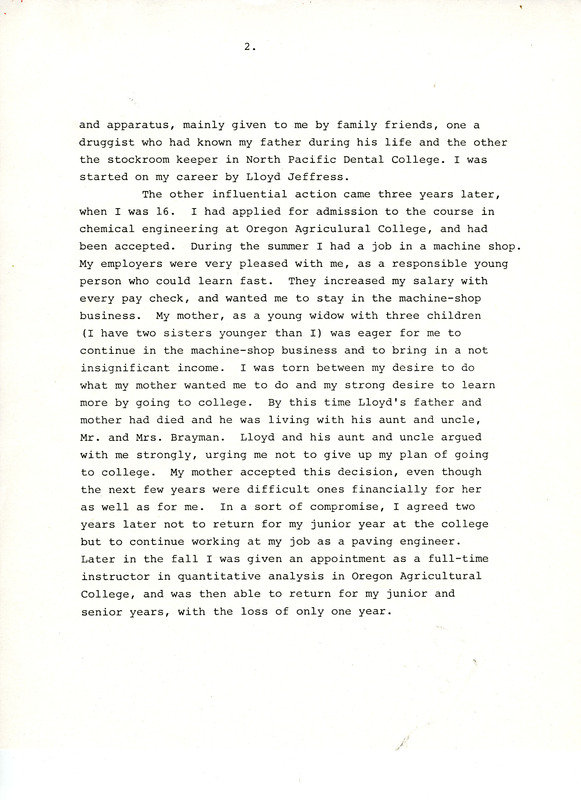 In Stephenson’s handwritten memoir, titled P.M. Stephenson’s Life Stories, he recalled living with Pauling the entire first year and never mentions leaving Pauling behind. On the contrary, the manuscript focuses mostly on Pauling’s brilliance, describing a young man who would finish assignments quickly and then immediately find something more to teach himself. We learn from the memoir that one of the scholarly hobbies that Pauling picked up as an undergrad was teaching himself Greek. Stephenson was impressed, but being a more veteran college student, he spent ample time studying and his free moments socializing. Perhaps it was these diverging interests that led the two cousins to spend so little time together. 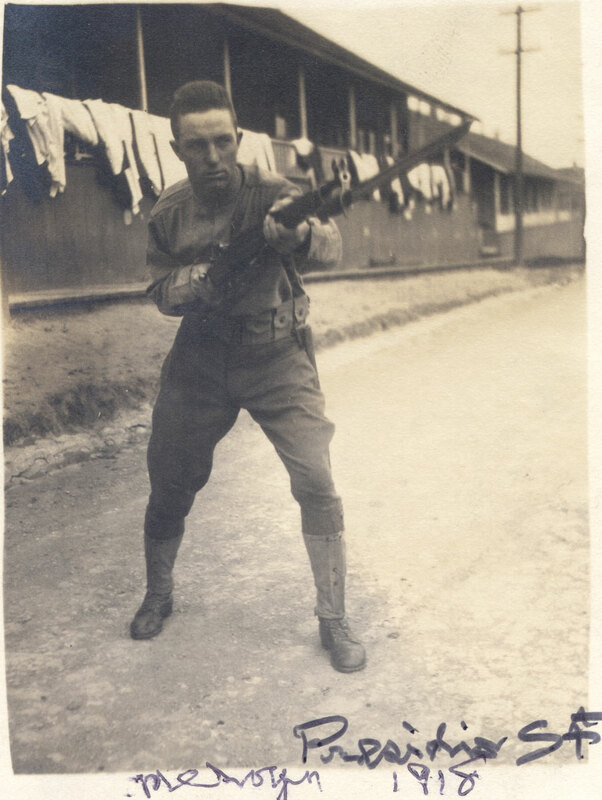 Mervyn Stephenson, training at the Presidio, summer 1918. 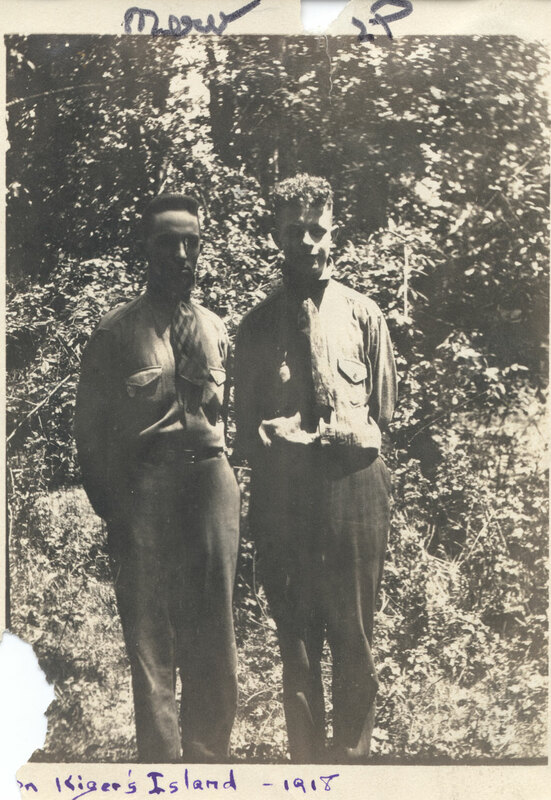 The two young men were very much together in the summer of 1918 when they left for San Francisco for intensive officer training at the Presidio military base. Stephenson recalled Pauling as having been a strong supporter of the war effort while at the camp. With the completion of his officer training, Stephenson was promoted to the rank of cadet major. He was then one of ten men at OAC to receive recommendation for commission as second lieutenant in the Officer’s Reserve Corps. That summer the cousins also worked together when they stayed in Tillamook, on the Oregon coast, with Stephenson’s mother. The two worked in a shipyard for the summer, building wooden-hulled freighters and taking small holidays in their off hours to go with Stephenson’s mother and sister to the resort town of Bayocean. Stephenson’s senior year looked as if it would begin with a move overseas to serve in the war. Mervyn had received his second lieutenant commission and was notified that he would report to Fortress Monroe, Virginia, but his orders were never received because the war ended on November 11 of that year. He finished his senior year in due course, graduating from OAC’s College of Engineering, and was granted membership in the Zeta chapter of the Sigma Tau engineering honorary society. Mervyn and Linus then parted ways as Pauling continued his studies and Stephenson moved forward in his career as a bridge builder all across Oregon. In the final months of 1981, Ava Helen Pauling was slowing down and making her final public appearances. She was spending as much time as possible with her husband and children, but encouraged Linus to stay busy and travel because of his difficulty dealing with emotional distress. She had been diagnosed with a form of inoperable cancer, and had decided against the use of chemotherapy. According to his family, Linus Pauling was convinced that he would be able to save her through the use of vitamin C and other supplements. He was unable to talk about her final arrangements so preparations, including Ava’s memorial service preferences and her desire to be cremated, were discussed with her daughter Linda over a long weekend. After surgeries, a long term fight with cancer and a number of other medical complications, Ava Helen died in her home on December 7. Following the death of his wife of nearly sixty years, Pauling was, understandably, quite lost. His children helped guide him through the funeral arrangements and Ava’s memorial service, andthough he gladly accepted their help, he was very resistant to other offers of assistance in the every day aspects of life. He stayed as busy as he could, and over the course of 1982 published three papers on the nucleus of the atom – a highly abstract program of work that afforded him some measure of escape from his grief. He still talked to her, holding phantom conversations as he spooned his vitamin C powder into his juice in the morning. He still looked for her, expecting to see her in the doorway, asking him to stop and take a walk, to come to lunch. He would cry and look out to sea. Then he would get back to work. Though he was managing to get by under the circumstances, maintaining his health and taking care of himself during the following months, there remained a need for some kind of a mechanism that would allow him to deal with his grief. 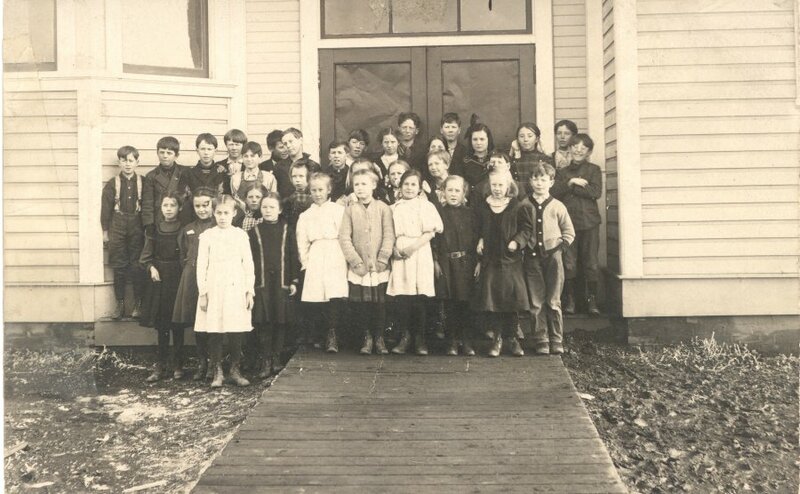 Just such an opportunity came in the form of his sixtieth Oregon Agricultural College class reunion. He decided to attend, and set off on what would become a long and meaningful journey. 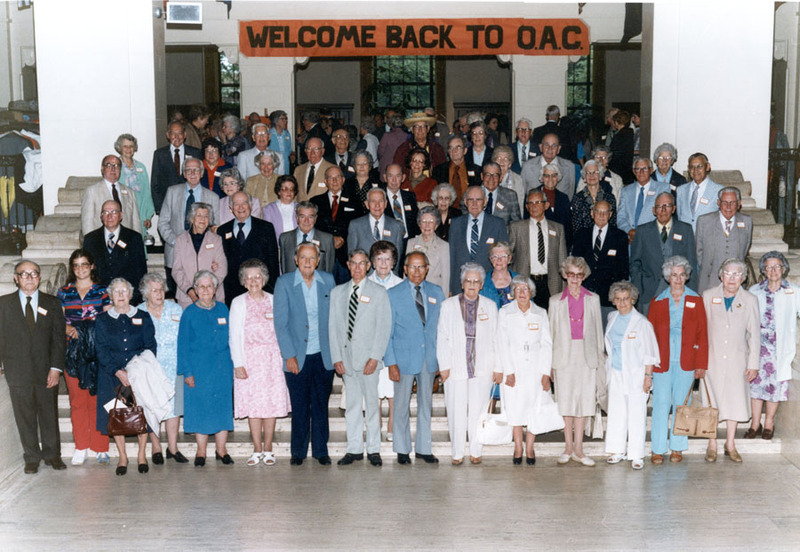 Sixtieth anniversary reunion of the Oregon Agricultural College class of 1922. Lucile and Linus Pauling are located second row from bottom, left. 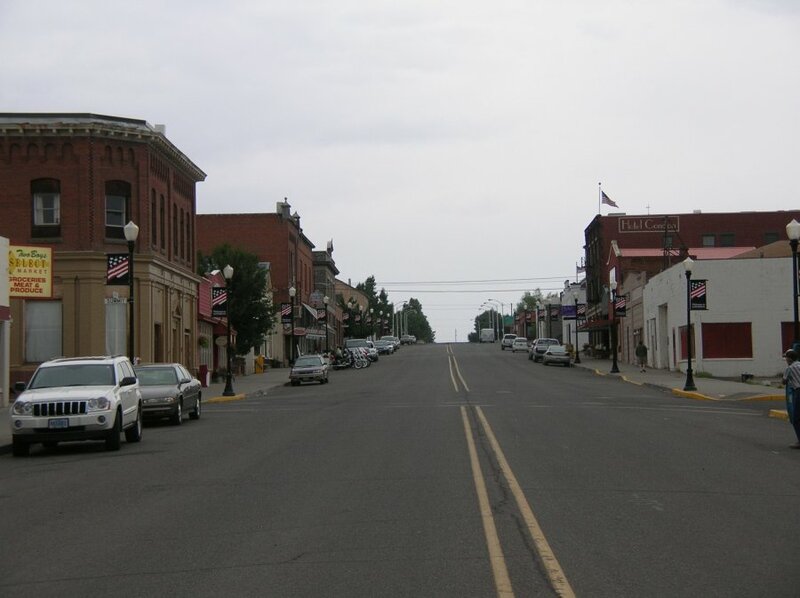 His first stop was Dayton, Washington where he had worked for the Warren Construction Company in July 1923. 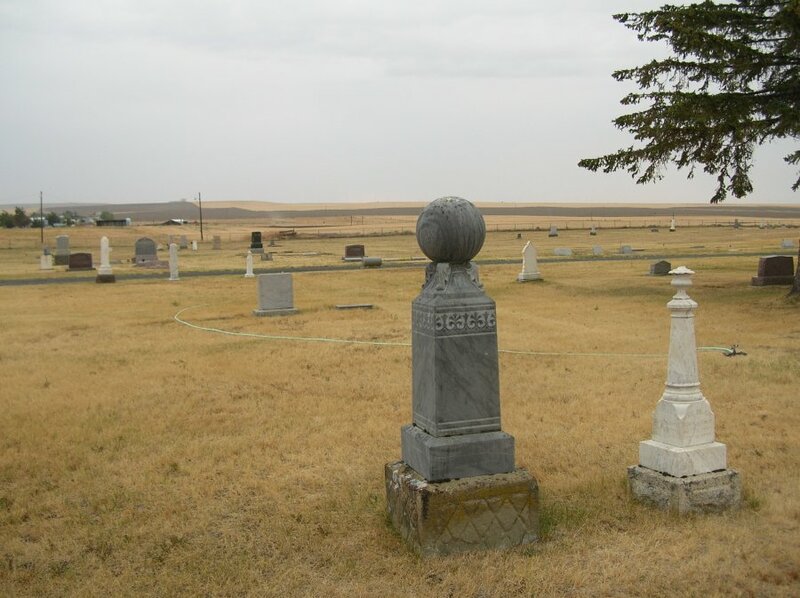 He and his wife had spent a month there just after being married, and Pauling wished to revisit a number of locations that had meaning to the couple. He went to the intersection where the hotel they had stayed in once stood, and he walked around town and noted the place where Ava had outscored him on an IQ test they had taken. 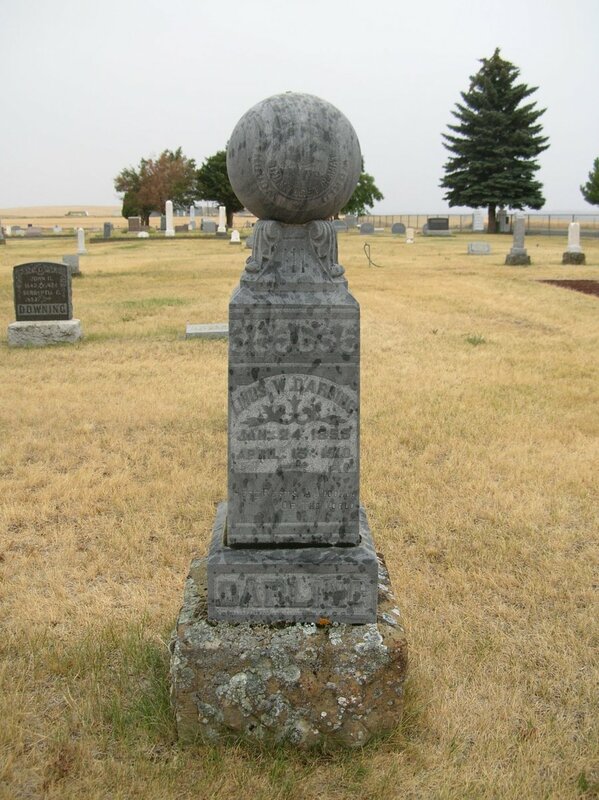 The following morning he drove across the border into Oregon, visiting Arlington and then Condon, where he visited the grave of his grandfather Linus Wilson Darling for the first time. He spent the next day on the Oregon coast, seeking out former vacation and employment spots in Seaside and Tillamook, and then drove to Corvallis for a few days before attending his class reunion at Oregon State University. The day after his reunion, Pauling spoke on the capitol steps in Salem, discussing nuclear weapons and the need for peace. He spoke later that same night, once again on peace topics, at the First Methodist Church in Portland. 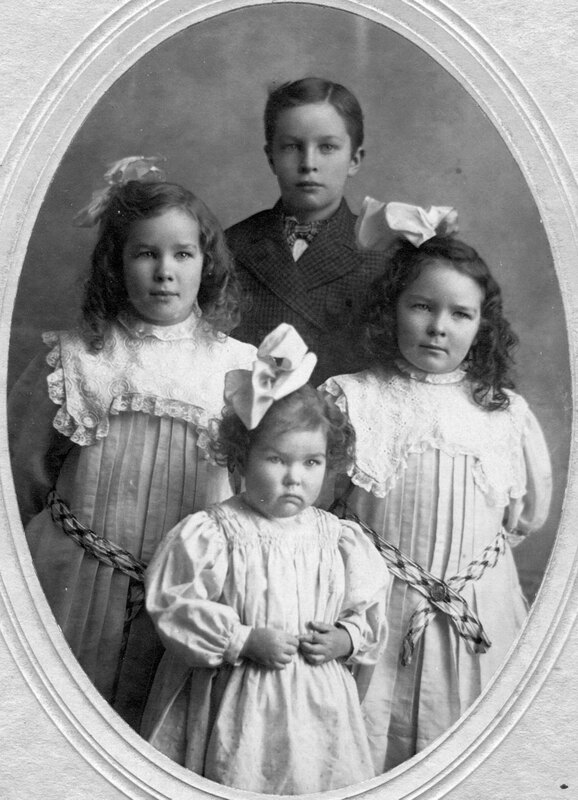 The next day he met with his sisters and a cousin to deliver to the director of the Oregon Historical Society the diaries that Linus Wilson Darling had kept in the late 19th century. After lunch with his relatives he began his drive back home, stopping at a portion of highway along Grave Creek – he had spent five months in 1919 working on the highway there, sleeping in a tent near a covered bridge. At the time of his visit, the covered bridge was still in existence but the highway was partially destroyed, having been intersected by the construction of Interstate 5. Pauling became involved once again with his institute, and in early 1983 settled a lawsuit that had been consuming valuable time and resources. He spent half of his time at his ranch, and the other half in Palo Alto. He developed a routine, waking up before five in the morning, and reading himself to sleep at night after a full day of research and theory. Despite his loneliness, Pauling would live for another twelve years, continuing to pursue his scientific work, speak on world peace and manage his affairs. 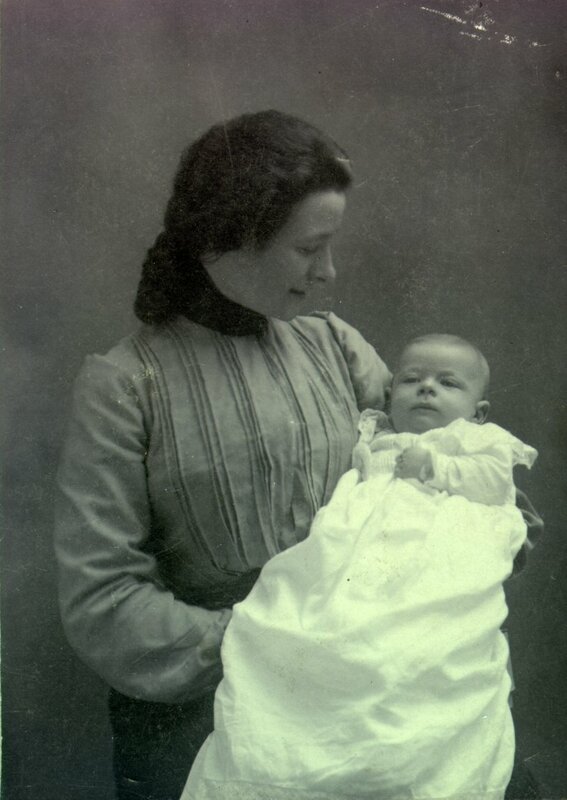 Pauline Pauling with her sister Lucile, 1916. 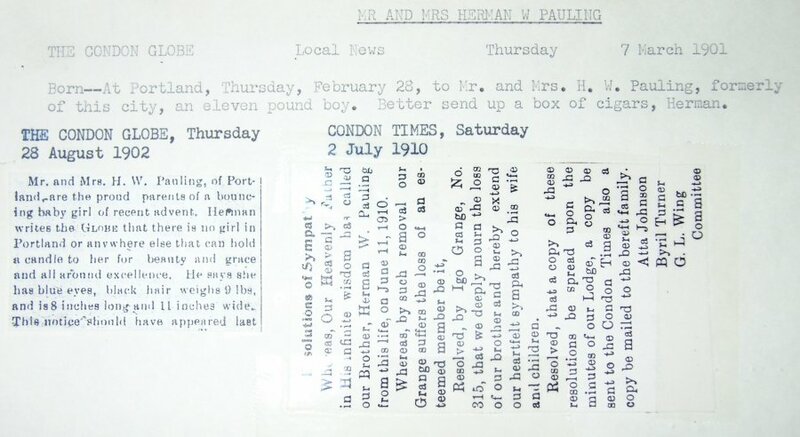 The sister of one distinguished scientist and later the wife of another, Pauline Darling Pauling, the second oldest of the Herman and Belle Pauling’s children, led a long and eventful life. Once a record-breaking typist, a famous women’s athletic director, and a successful designer and businesswoman, Pauline found success in a plethora of careers and hobbies. Although she remained close to her Nobel Prize-winning brother over his lifetime, Pauline harbored more artistic aspirations than scientific ones. In addition to her professional success, she was a seamstress, quilter, painter, and coin and doll collector. Pauline Pauling was born in Portland, Oregon on August 2, 1902. 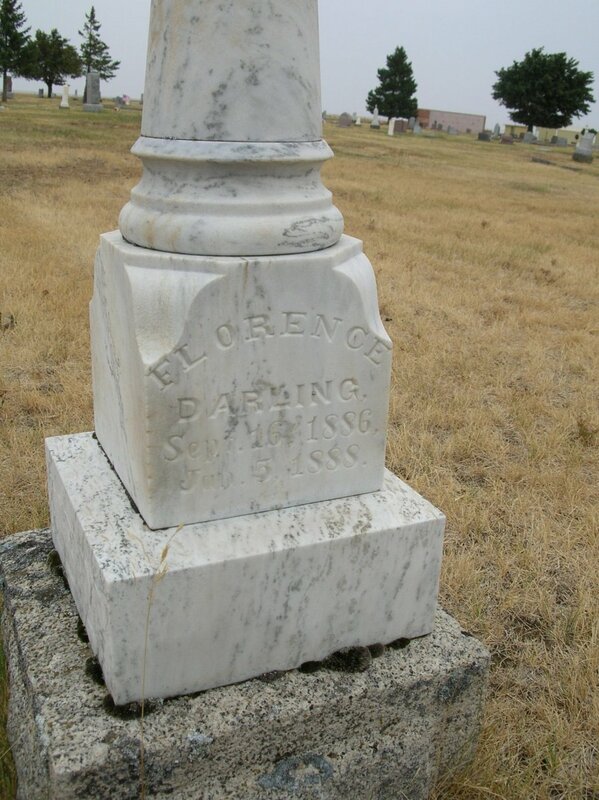 She remembers her childhood in Condon as “very stark,” remarking that “it was a wonder [the family] survived.” Following her father’s death in 1910 and the family’s ensuing financial trouble, her mother, Belle Darling Pauling, opened a boardinghouse to support the family. 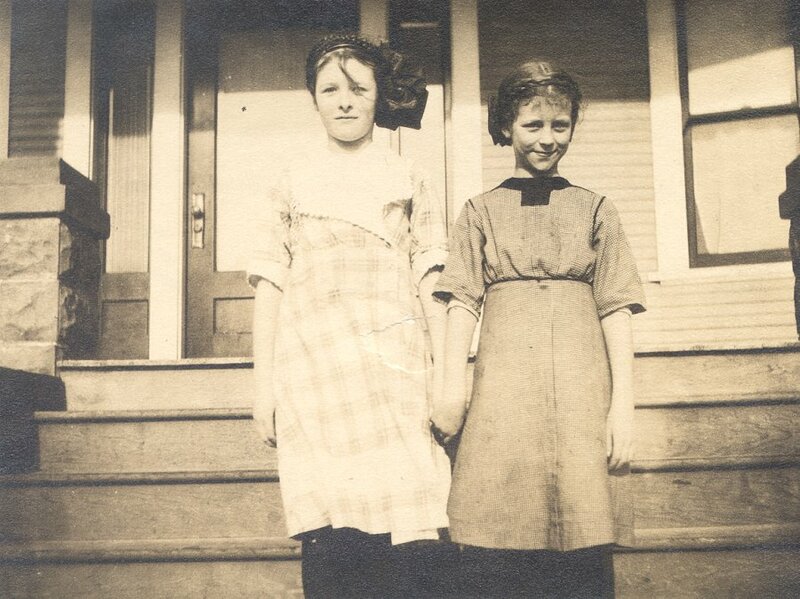 Linus, Pauline, and their younger sister, Lucile, were responsible for the many domestic duties of the boardinghouse as their mother, suffering from a general weakness (later diagnosed as pernicious anemia), had become increasingly dependent on the help of her children. 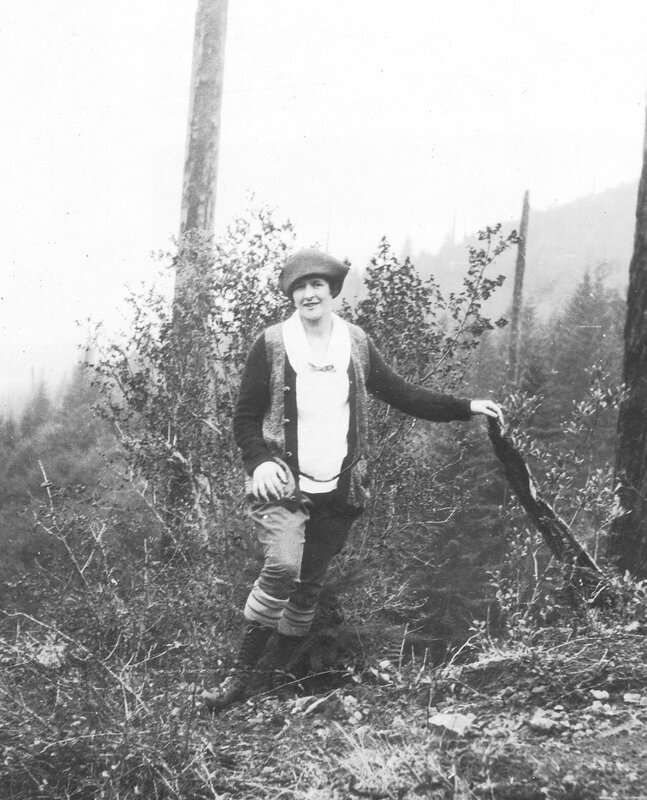 Pauline Pauling on a hiking excursion in the Oregon forest, 1921. Pauline, an extrovert by nature, couldn’t wait to escape the small-town life of Condon. An energetic and pretty girl, Pauline became something of a socialite as a teenager. She dated a string of boys, frequently attended swimming and singing events, and often arranged social get-togethers. As a student at Franklin High School in Portland, Pauline dropped out for a year to attend the Behnke-Walker Business School. There she learned Pitman shorthand and the touch system of typing. She would later become known for her speed typing, breaking the world record on a manual typewriter in an unofficial test. 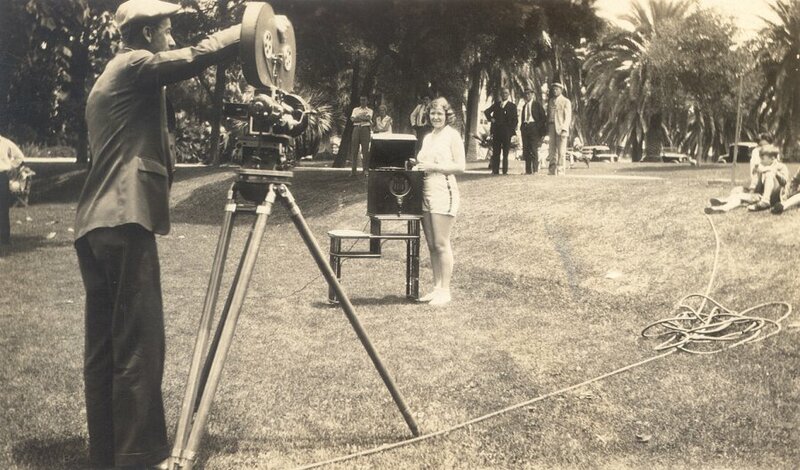 Pauline Pauling participating in a filmed athletics demonstration, Los Angeles, 1920s. 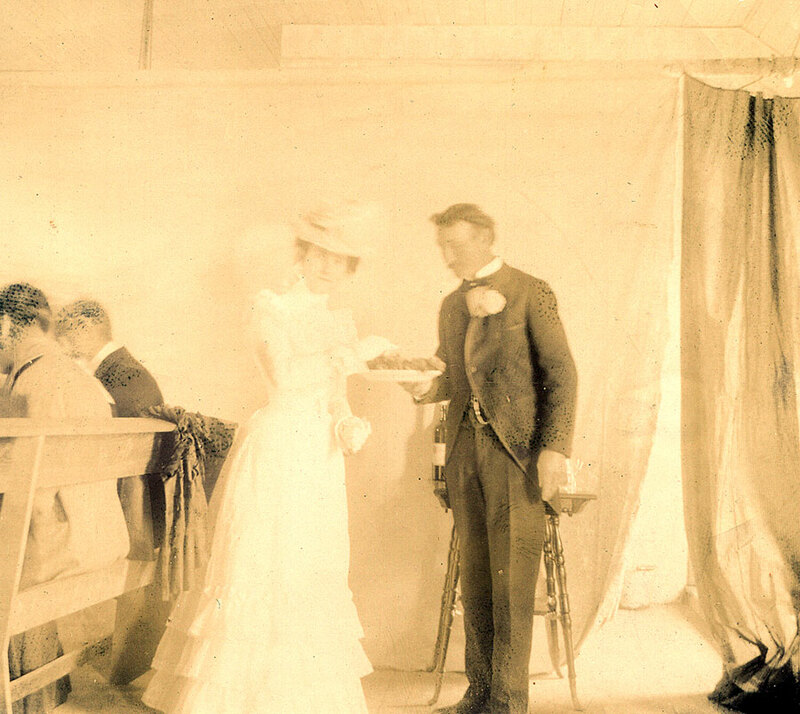 She met her first husband, Wallace Stockton, while working as a secretary for the Elks Club in Portland. 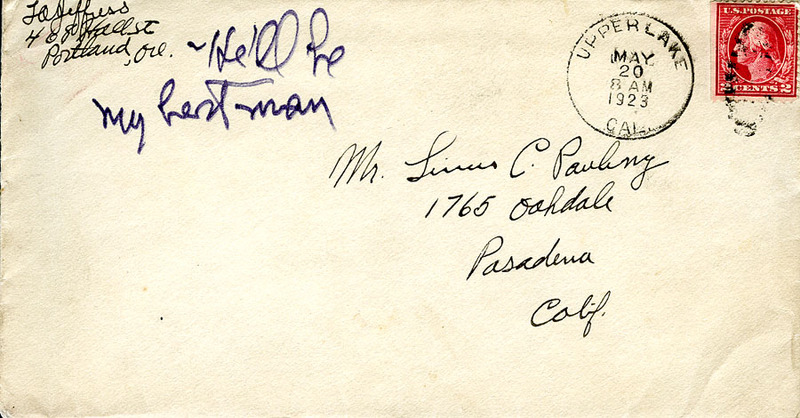 The couple later moved to Los Angeles, where Pauline worked as the Women’s Athletic Director for the Club. Known as the “Elkettes,” the women’s group, attracting some of Hollywood’s most famous stars, gained much publicity for its numerous activities and events. Pauline and Wallace Stockton divorced in the late-1920s. 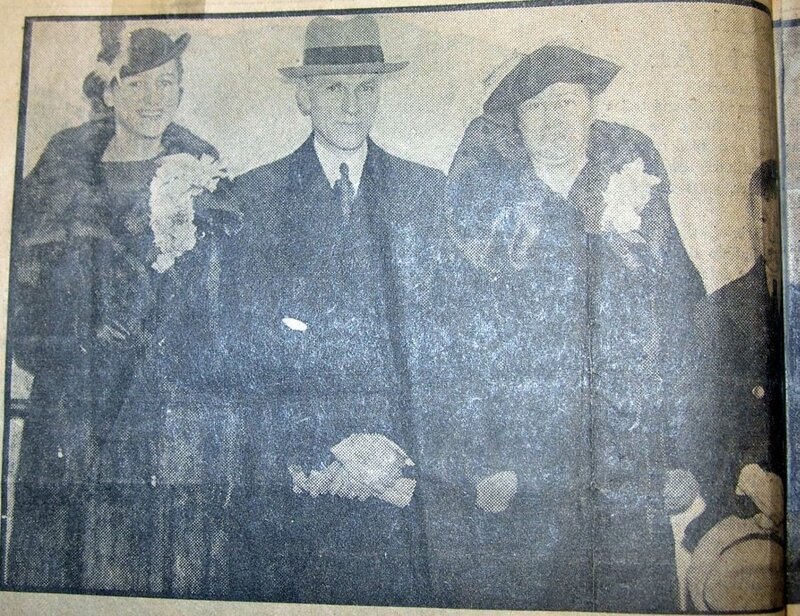 On October 6, 1932, Pauline married Thomas Ney. After living in Santa Monica, the two moved to Inglewood, California, where their son, Michael Ney, was born on December 23, 1934. Pauline Pauling, posing for a Paddies, Inc. promotional photograph, 1940s. It was around this time that Pauline took notice of a men’s slipper in an issue of Vogue. Using the pattern, Pauline refined the design to create a women’s slipper. Soon after impressing her friends with the prototype, Pauline began making the slippers and selling them from her home. Subsequently, her initially-modest business (Paddies, Inc.) grew rapidly. 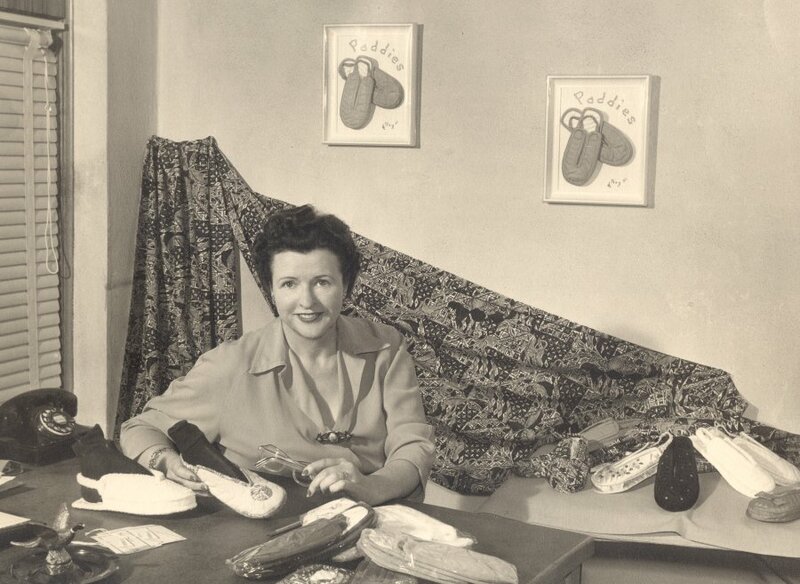 She began marketing the “Paddy” slipper to upscale department stores like Saks Fifth Avenue, Macy’s, Neiman Marcus, and I. Magnin. Unfortunately, Japanese manufacturers were able to copy her design and thus flooded the market with a cheaper model. Pauline lost her big accounts and, as a result, decided to sell the company. In 1950, Pauline and Thomas Ney divorced. After returning to Santa Monica, California, Pauline became interested in numismatics, eventually opening her own coin shop in 1960. It was during this time that Pauline became acquainted with Charles “Slim” Dunbar, a coin shop owner from Inglewood. The two were married on August 25, 1973. Sadly, Slim, in ill health, died just 23 months after their wedding. 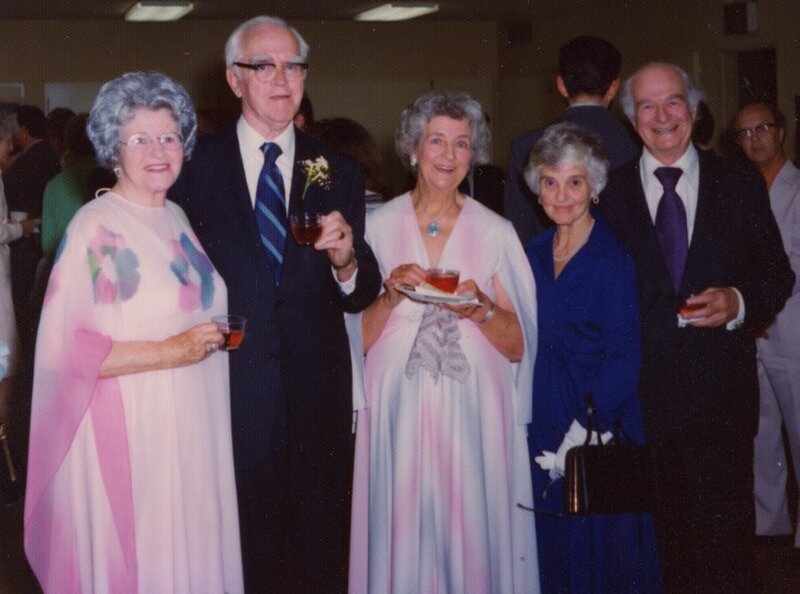 Pauline Pauling, Paul Emmett, Lucile Pauling, Ava Helen and Linus Pauling, 1976. 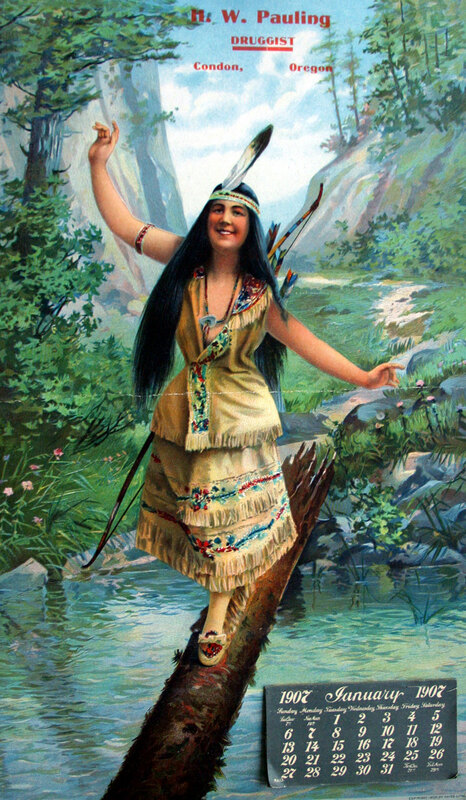 Following Slim’s death, Pauline returned to Oregon. It was there that an old friend, Dr. Paul Emmett, re-entered her life. 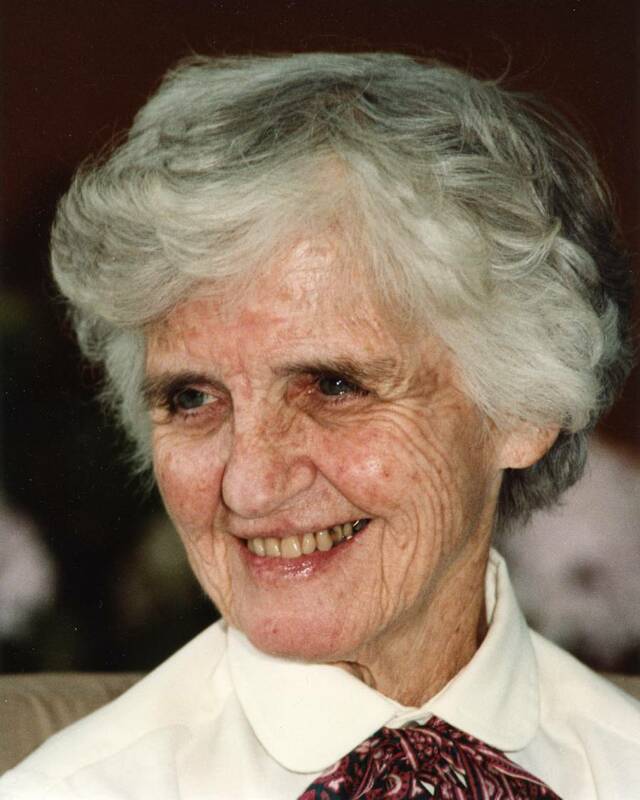 Dr. Emmett, a prominent catalysis scientist, was a longtime friend and colleague of her brother. Emmett was, as Pauline recalls, “underfoot every minute until [she] accepted his proposal.” The two were married on May 22, 1976. Pauline Pauling with her big brother Linus, 1993. 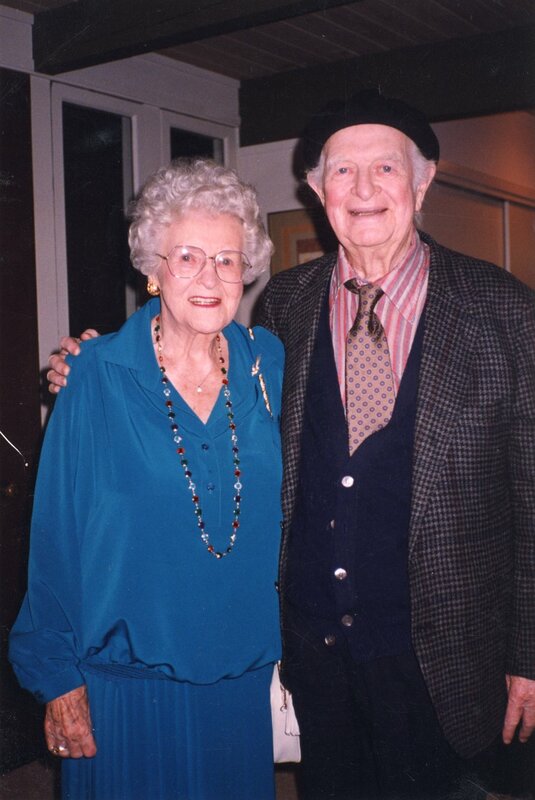 Pauline, lively even in her later years, cared for Dr. Emmett (who suffered from Parkinson’s disease) until his death in 1985. Following her husband’s passing, Pauline continued to live in the Portland area until her death on October 19, 2003. She was 101 years old. 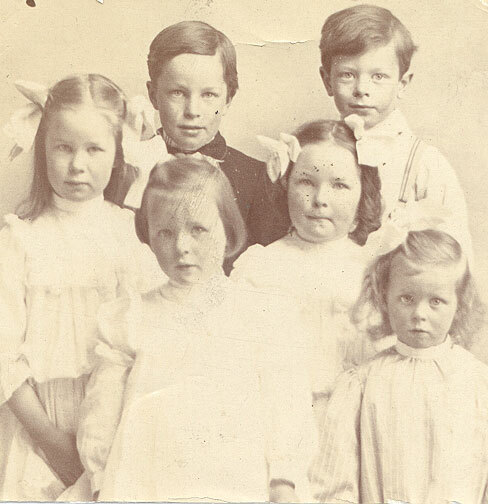 Check back next week when we’ll discuss the life of the youngest Pauling sibling, Lucile. For more stories of Linus Pauling’s connection to his home state, please see our growing Oregon150 series. 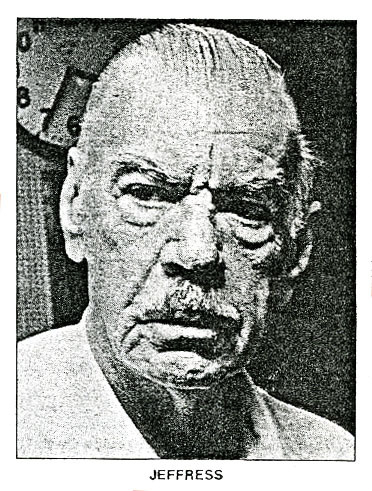 Photo of Lloyd Jeffress, extracted from Physics Today, December 1977. 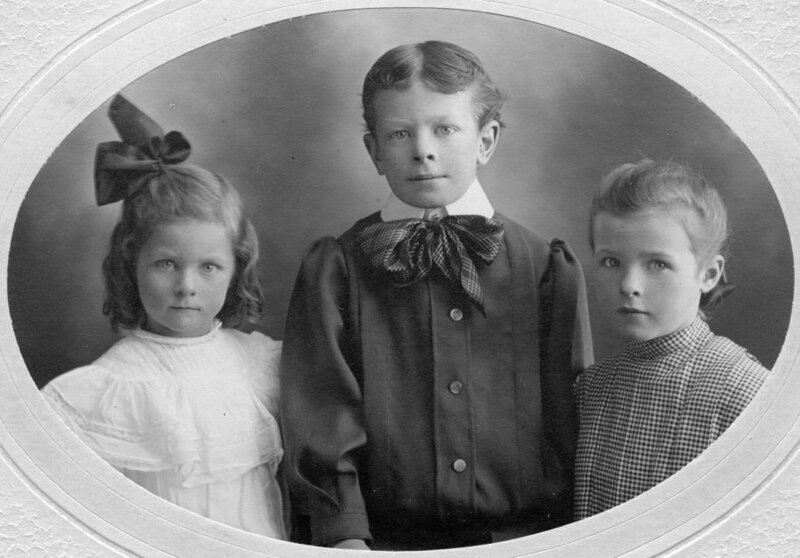 As a child, Linus Pauling had relatively few friends. 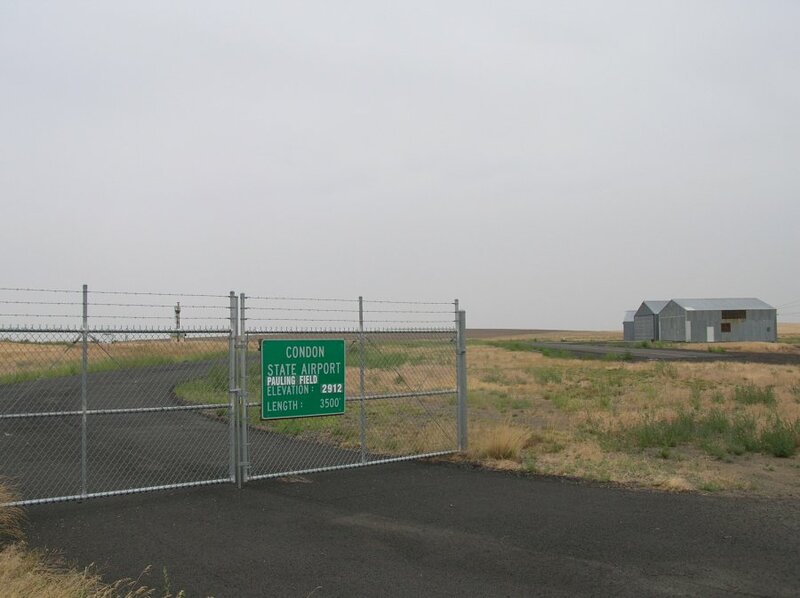 After moving from Condon, Oregon to Portland, the death of his father and subsequent poverty forced him to work when not in school. The remainder of his time was consumed with studying and household chores, leaving little room for companionship. Pauling, even as a boy, was also exceedingly introspective and self-reliant, capable of quietly entertaining himself without supervision. Nevertheless, even the busiest and most independent children need friends. In 1913, while walking home from school, Pauling began talking with another young boy, Lloyd Jeffress. The two quickly discovered a mutual interest in science and natural phenomena, and Lloyd invited Linus to his home to view a chemistry experiment. Pauling readily agreed and, within the hour, Lloyd was performing a series of basic chemical reactions that bubbled, fizzed and smoked, transfixing the young Pauling. It was on this day, in Lloyd Jeffress’ little Portland bedroom, that Pauling decided to become a chemist. From that point on, the two boys were inseparable. When not at school or work, they were performing crude, and sometimes dangerous, experiments in the makeshift lab that Linus built in the Pauling basement. Using donated or pilfered chemicals, the boys created noxious gases and exploding powders while dreaming of getting rich as corporate chemists. 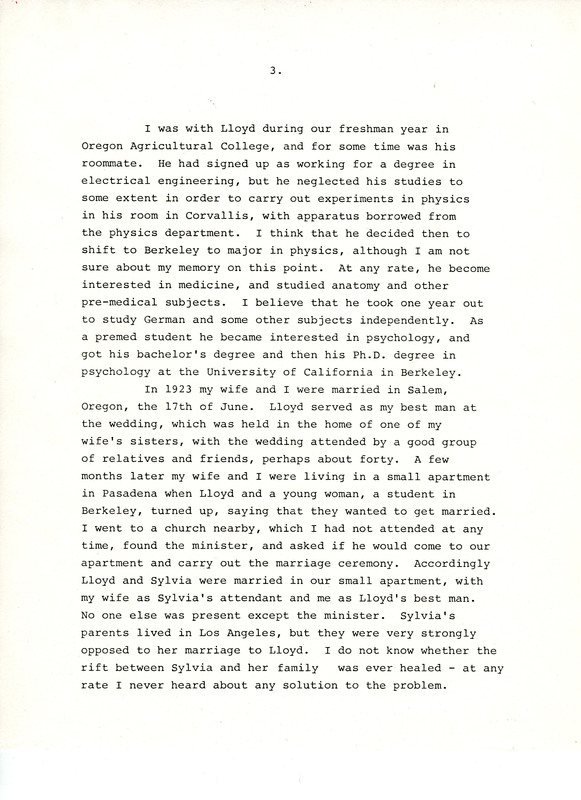 As an adult, Linus Pauling often told a story of Lloyd Jeffress to friends and interviewers. At the age of fifteen, Pauling had imagined himself as a chemical engineer, working for one of the United States’ major companies. When Pauling told his grandmother this, Lloyd chimed in saying, “No, he is going to be a university professor.” Jeffress’ words proved prophetic, as Pauling spent more than thirty years as a professor at the California Institute of Technology. 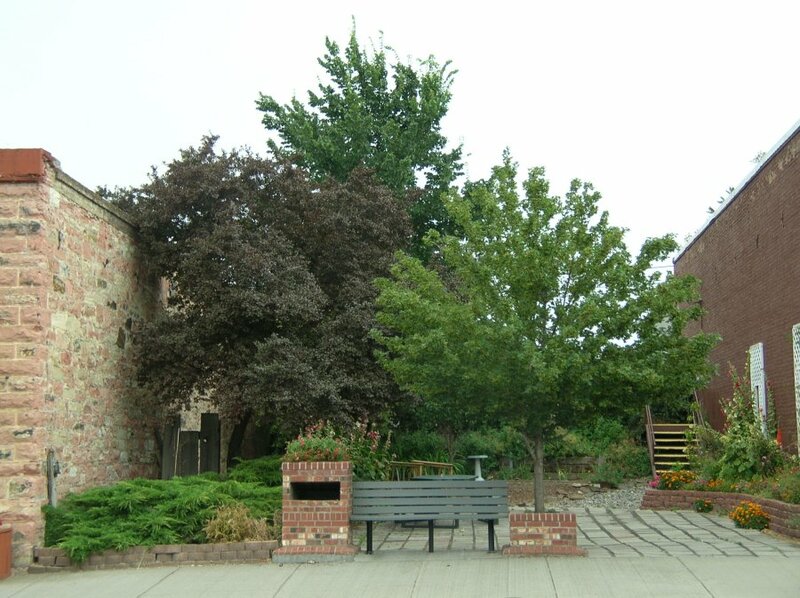 Following high school, Linus and Lloyd both attended Oregon Agricultural College, where Pauling studied chemistry and Lloyd majored in electrical engineering. Jeffress, however, developed an interest first in physics and later in the medical field, eventually graduating from the University of California with a Ph.D. in psychology, while Pauling, of course, took at job as a chemistry professor at Caltech. Despite the divergence in their interests, the two stayed in intermittent contact for the following sixty years. 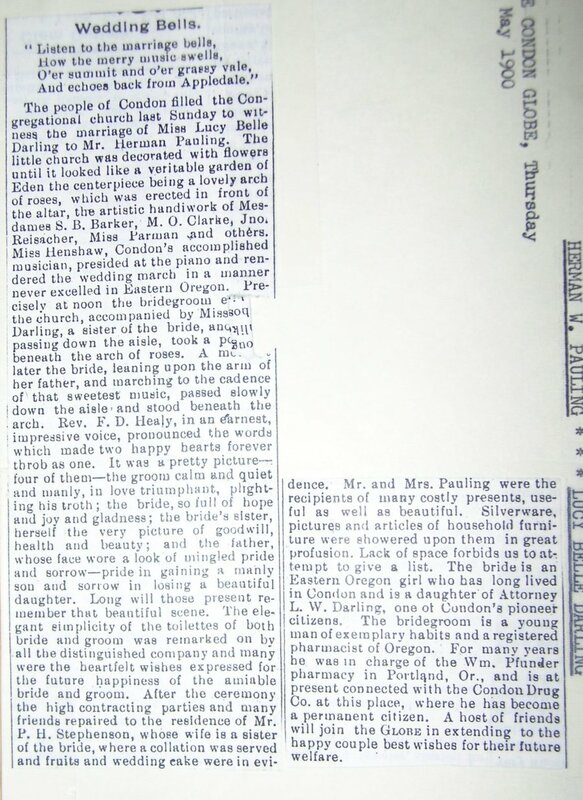 Lloyd Jeffress served as best man at Pauling's wedding. Linus and Ava Helen also gave their second-born son the name Peter Jeffress Pauling. With Pauling at Caltech and Jeffress at the University of Texas in Austin, it was difficult for the men to meet. They visited one another as regularly as their schedules would allow, sometimes engaging in the tomfoolery of their youth. 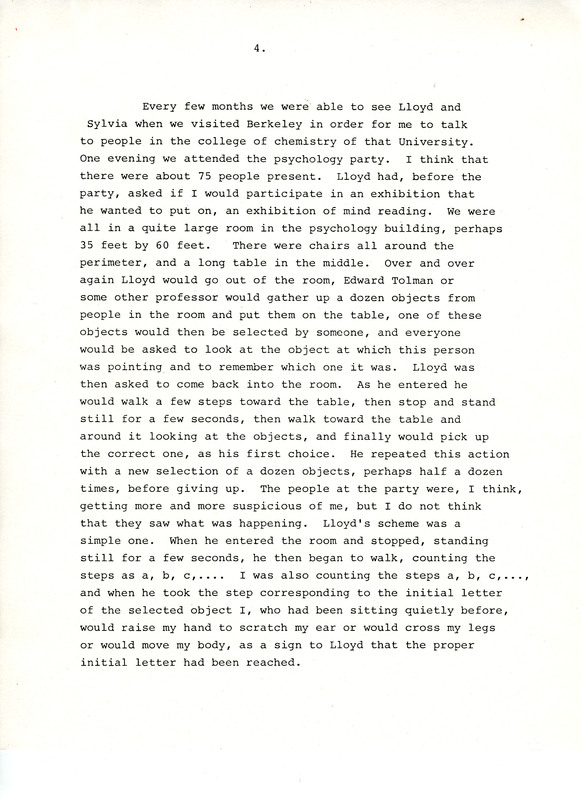 In a short manuscript written after Lloyd’s death, (see below) Pauling recounts their deceiving the guests at an academic event with Lloyd’s “mind reading” abilities, a hoax successfully planned and orchestrated by the pair. 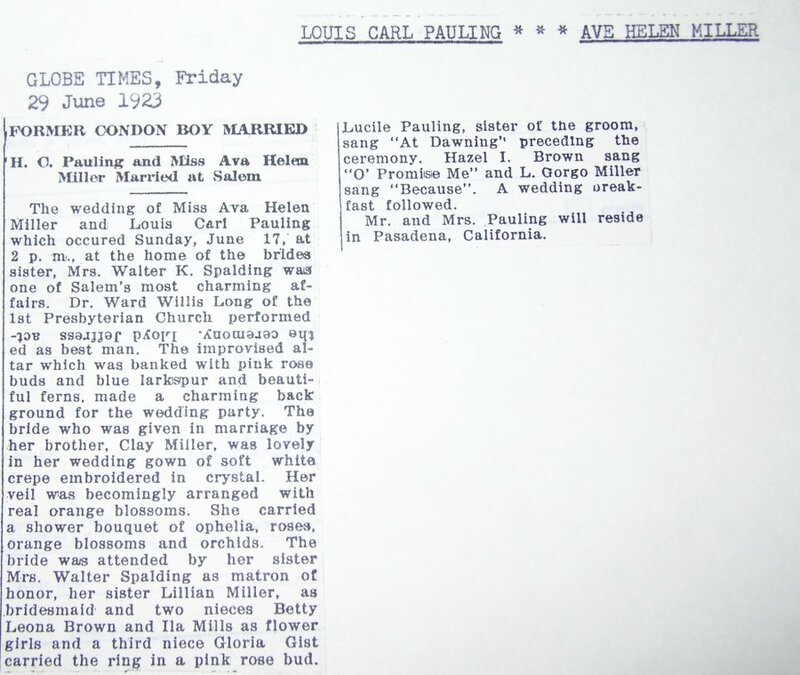 He also tells readers of Lloyd’s wedding, a hurried affair conducted by an unknown minister in Linus and Ava Helen Pauling’s small California apartment with only the Paulings to act as witnesses. Jeffress, like Pauling, was a highly successful member of the academic community. Though his career began slowly, the breadth and depth of his research expanded considerably as he aged, with the vast majority of his papers being produced after his 50th birthday. 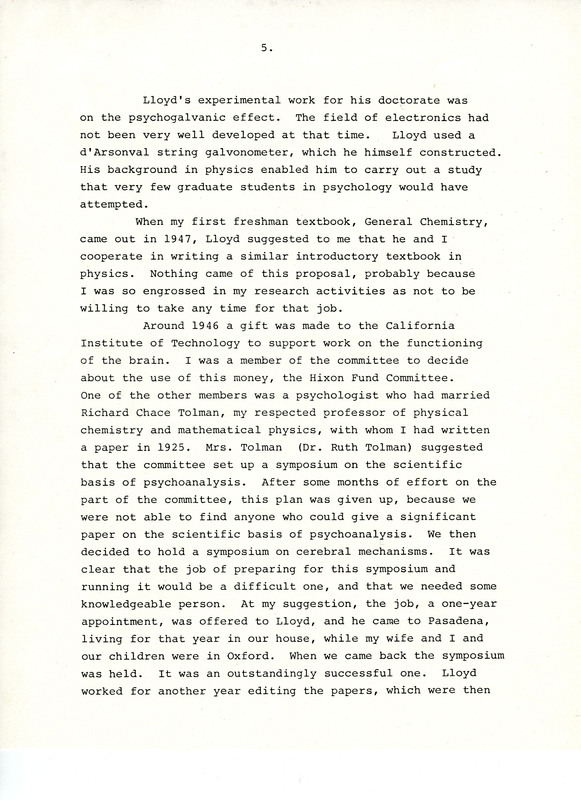 As an expert in experimental psychology, focusing on psychoacoustics, he served as the chairman of the University of Texas psychology department, and even worked with various military-based programs. Additionally, his longstanding interest in physics led him to take over some physics classes while serving in the university’s psychology department. Perhaps more surprising, his experience with wave transference resulted in work on mine-detecting devices for the United States military. Over the course of his career, Jeffress earned a series of awards and commendations for his excellence as an educator and for his contributions to the field of psychoacoustics. Pauling personally took great pride in his friend’s successes, expressing special interest in his scientific papers. 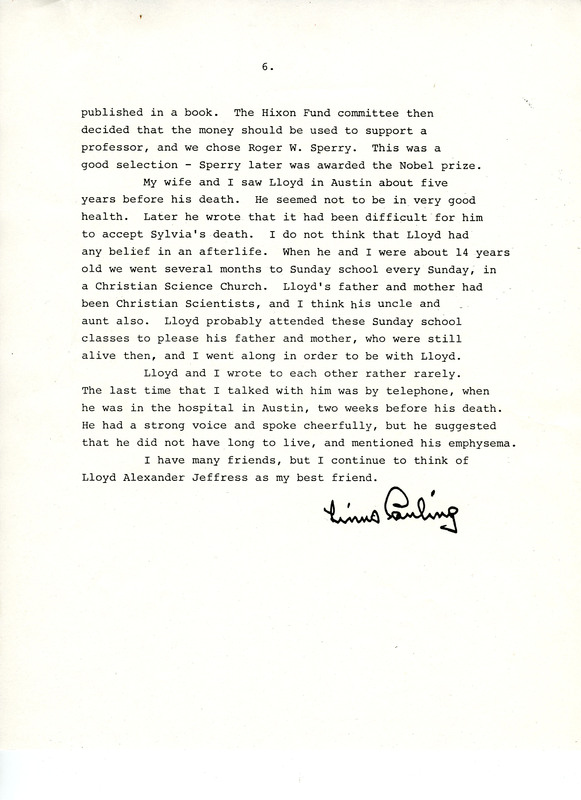 For more on the life of Lloyd Jeffress, please see Pauling’s typescript below, as well as this lengthy memorial resolution (PDF link) prepared by members of the University of Texas faculty. 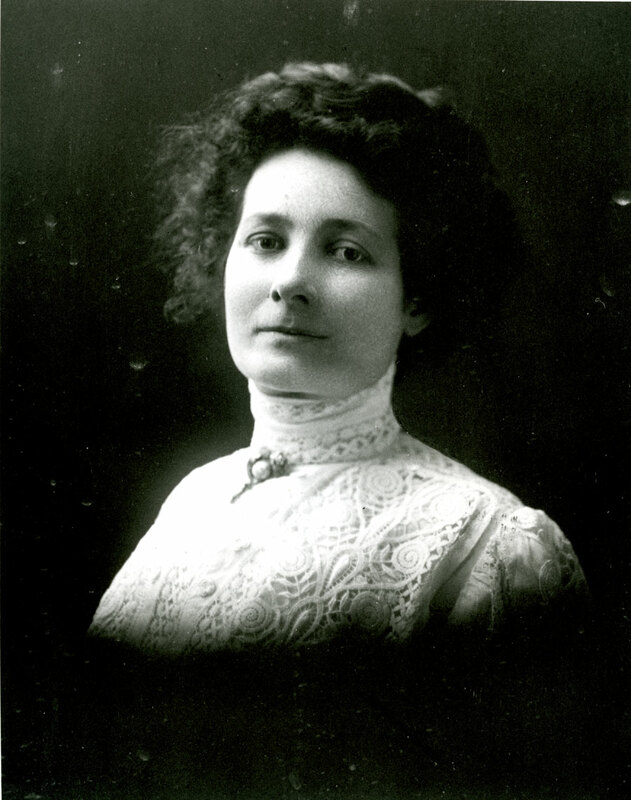 For more on Pauling’s links with Oregon, check out our continuing Oregon150 series. 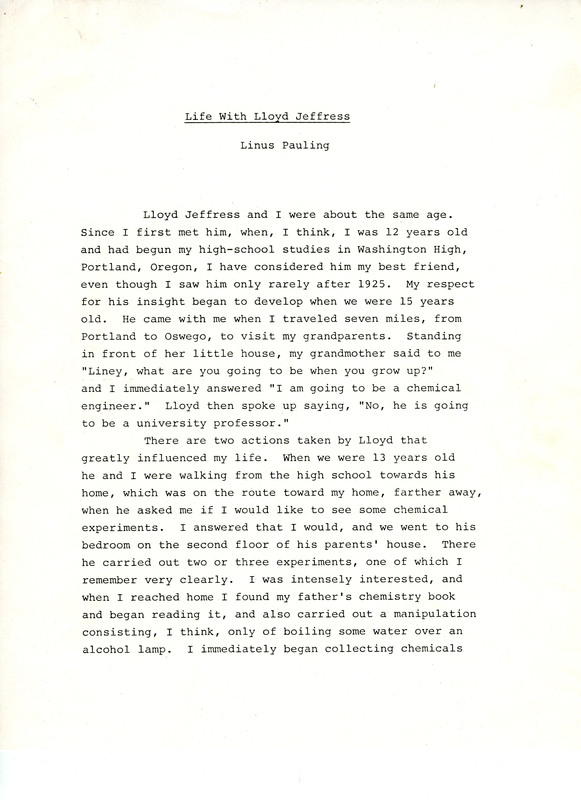 “Life with Lloyd Jeffress,” by Linus Pauling, June 5, 1986.